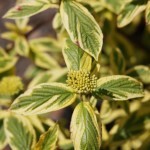 A fast growing, dense shrub with bright golden yellow and green irregularly variegated leaves that contrast vividly against burgundy red stems. Leaves turn shades of red, pink and gold in the fall. Prune to remove older stems to encourage new growth. A selection of a North American native plant. Adaptable to most soils and prefers full to part sun.